The suite, perched on its own level , has the best view in the whole hotel. The king bed faces the Pacific Ocean and there’s a private terrace with typical “equipales” to enjoy the ocean breeze. Beds split in to 2 singles. El Faro is a funky room on the third floor with a nice king bed that can be divided in to 2 singles and a private patio. From the patio, the room has two different views of town. Tizate has a twin bed and a queen bed – for those who prefer not to share. It’s located off the lobby on the entrance floor. This room is small, cozy and has multiple beds for families or close friends. One queen bed, and two Singles, bunk bed style. On the same floor as the common living room, there is ample space to hang out, and best of all, breakfast every morning right outside your door. El Anclote is a large room with a king bed that can be split in to 2 singles, and the wrap-around porch has great views of the town going by. The porch also has a hammock and there’s a terrific mural in the bathroom. Just right for two, Las Islitas gets a nice view and has access to a terrace. San Blas is among the most spacious at Sayulita Central. The room features a wrap-around patio with views of the ocean, town and hills surrounding Sayulita; Queen bed plus one single and the hammock is the perfect place for an afternoon siesta. Located on the main floor with its own sitting room, a queen bed plus single person couch. Chacala is really more of an apartment than a hotel room. Veneros has a comfortable queen bed and two windows to catch the ocean breeze, plus access to a shared terrace. La Bahía is on the same level as the lobby. It has a matrimonial bed and a spacious bathroom. Palmitas has a comfortable matrimonial bed, a full bathroom, and a great private patio with views of both the ocean and town. Perfect for relaxing after a long day of surf and exploring town. 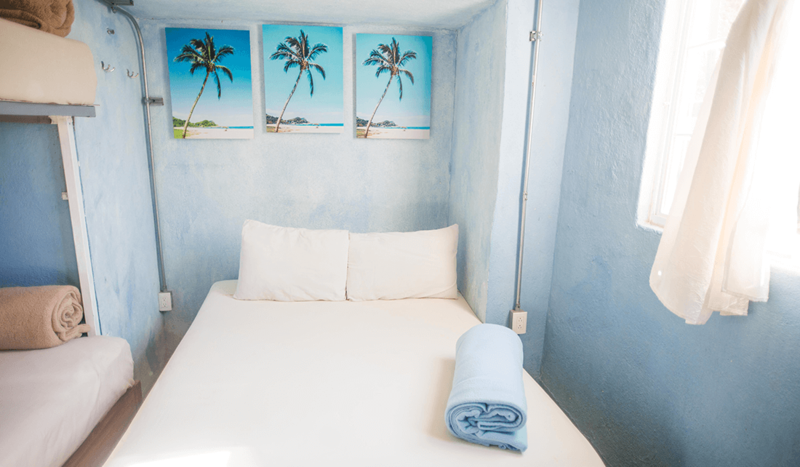 Small, comfortable, really inexpensive and easy on the eyes, La Lancha is on the same level as the Sayulita Central lobby and has a king-sized bed that can be split in to 2 singles. There’s no terrace or porch but you can of course enjoy the hotel’s extensive common areas. Our most secluded room, Platanitos is a cute space tucked under a slanted roof with window slots of windows that create a lovely cross-breeze. Website designed by Cat James. Copyright © 2018 Sayulita Central Hotel.